Synopsis for Volume 1. The synopsis for Volume 2 can be found here. Marni is a young girl dealing with the recent death of her grandmother, which has left her emotionally devastated and struggling to cope. Granny Hitchins was a wonderfully curious woman, responsible for giving her granddaughter a rich sense of imagination and adventure, as well as an old and mysterious "Artifact." Granny Hitchins found the Artifact when she was herself a child and, with origins unknown, it provided a lifetime of adventure, speculation, and storytelling for herself, her son, and finally, her granddaughter. While not a replacement, the Artifact is nonetheless a treasured memento for Marni after her grandmother's death. With the love and support of her two best friends, Sophie and Elora, and the magic of the Artifact to comfort her, Marni is just beginning to cope with the loss of her beloved grandmother when her life takes an abrupt and strange turn. While the girls are examining the Artifact on a backyard camping trip, the object suddenly takes on a life of its own, transporting the three friends and their tent to a strange and distant world. 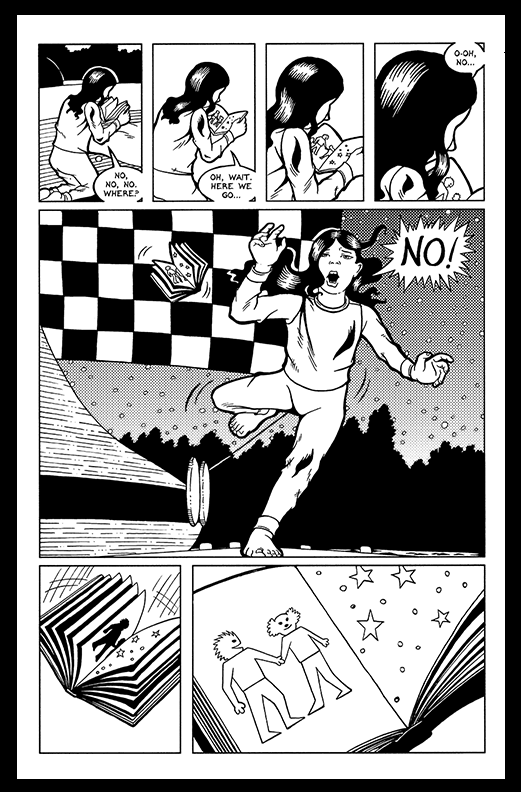 After exploring the tent and their immediate surroundings, the girls discover that the Artifact has vanished, leaving them alone and afraid under a very alien sky. After summoning their courage, Marni, Sophie and Elora venture out to explore their alien surroundings, where they find a surreal world containing a robot, a mysterious far-off tower, and an illusive yet terrifying monster. Scared, yet buoyed by the stories and songs that they've heard while growing up, the three girls gather their meagre supplies and head out into the wilderness, determined to find a way home. In the concluding volume of Stargazer, Marni, Elora, Sophie and their new-found robot friend finally reach the distant tower they spotted earlier in their adventure. Expecting to find help at the tower, the girls are stunned to discover that it is not only old and heavily damaged, but also clearly abandoned. As the friends are dealing with their disappointment and starting to plan their next move, they suddenly find themselves surrounded by an odd assortment of little creatures, similar to the robot. While not necessarily the help the girls wanted, the silent but friendly alien friends are nonetheless welcome companions. Once inside the ruined tower, the girls make a few discoveries, ranging from curious to downright ominous. While Elora goes off on her own, looking for answers to her own questions, Sophie and Marni are convinced that many of the answers they need can be found on the upper levels of the tower, on the other side of a long-ago landslide of rubble and boulders. With the return of the monster that threatened them at the start of their adventure, the girls must unite to face their fears and fight for their lives. Can the power of friendship and imagination get them safely home? And does their magical quest have a fairytale ending? 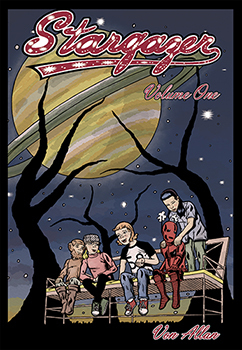 Stargazer Volume 1 has an ISBN of 978-0-9781237-2-7 and a Diamond Item Order code of AUG111260. 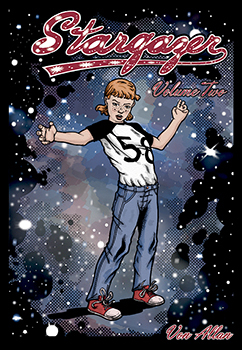 Stargazer Volume 2 has an ISBN of 978-09-781237-4-1 and a Diamond Item Order code of AUG111259. Both volumes have a suggested retail price of $14.95 US and are presented in black and white. Both volumes can be downloaded for free right here. A "tip" sheet, high rez images of the front cover, shelf talkers and other information can be found at here. Marni (from my original writing notes): Character-wise, Marni is a dreamer. She was the one that was always attracted to the Artifact; it filled her with wonder and imagination and she’d have long talks with her granny about it. A bit of a tom boy, Marni is quite happy tramping in the woods exploring. She’s probably a bit of a builder, too. Maybe constructing a milk carton boat to plop in some stream somewhere. A carrrot-top with shoulder length hair. Maybe some freckles sprinkled over her nose. An only child, Marni is fairly disconnected with her parents, not being really that close to either one of them. So the things that fire her imagination (say a book, a movie, or even her own writing or other creative things) aren’t things that she would share with her parents. If they walked into her room when she was busy scribbling down a story, she’d quickly open a drawer and hide it away from them. Not subtly, ‘course, but not to be mean. I don’t want it to be a result of her parents being too busy for her when she was younger; rather, she just feels that they don’t get her nearly as much as other people do. Definitely not nearly as much as her granny did. She's strong and fiercely independent, probably another trait that puts her at odds with her parents. She's very close with her friends, though, and feels the most comfortable when she's with them. Elora (from my original writing notes): Elora is a brunette with longish hair that she often wraps with a bandana. Somewhat bookish, but not shy. One thing I was chewing over was making Elora more of a practical character. down to earth, but not in a curmudgeonly way. I don’t want her to be lecturing or otherwise correcting the other two; aside from anything else, they are all friends. I really like the idea of her being a budding astronomer, hanging out with her granddad at a cottage and looking at the stars for hours on end, drinking hot chocolate and eating rice crispy squares on an autumn night. It might be fun to make her dad a mechanic and have her be pretty comfortable with machinery. Not so much electronics (she ain’t a ‘puter nerd) but just things mechanical. Elora isn’t prone to boasts or really speaking about things that she knows nothing about. She’ll keep her mouth shut at those times. But when it comes to something she does know a thing or two about, everything changes. She’ll speak her mind, often bluntly, and she doesn’t brook much argument on these points. She’s quite eager to learn, though, and she doesn’t restrict herself to just a few simple interests. Probably a bit like Star Trek’s Spock in this case – a bit of a sponge, absorbing quite a bit of everything around her. Her real interests, though, are in astronomy and mechanics. Unlike Marni, Elora is really close to both her dad and her grandfather. She’s similar to both men; there’s a strong practical streak that runs through all of them and it helps keep all of them grounded. Both of her main interests come from the two of them. Her granddad founded a mechanic shop years ago (probably in the 1950s, and he still proudly proclaims the Edsel as the greatest car ever built) and passed that on to his son when he wanted to retire. His retirement allowed him to pursue his other great love, stargazing, and he spread that love to his granddaughter when she got old enough to really comprehend it. Quite often she spends weekends with him at his winterized cottage, watching the skies from a large patio. Her other great love is cars, especially older ones that aren’t “fouled up” by computers. That mechanical streak binds all of the family together and keeps them connected. The drawback is that her dad does work quite a bit and she’s left to her own devices quite often at night. While she does either hang out at the shop with him after school and also spends quite a bit of time with her granddad, she’s left on her own quite a bit. Elora isn’t a loner by nature so it’s no surprise that she often chooses to spend her time with her Marni and Sophie instead. Sophie (from my original writing notes): Sophie is quite the burgeoning musician and really into a lot of Celtic tunes. Her granddad was the main song smith and music maker in her family but she never really got much of a chance to know him before he died. His death, a suicide, became a kind of open wound that no one in her family would talk much about. It devastated her grandmother (who was never the same after it) and her mom didn’t deal with it that well, either. She is reasonably close to her mom but this is just subject matter that isn’t talked about. That makes things a bit tricky when it comes to Sophie’s music; clearly talented, but the memory of her father’s suicide prevents her mom from really connecting with her on it. So, it’s the case of Sophie being dropped off at various folklore-type places and left to develop pretty much on her own. That’s left Sophie pretty dependent and fairly feisty when it comes to doing things her way. A strong stubborn streak runs through her; it would pretty much half to since the urge to quite music would have been pretty pronounced after her granddad’s death. It’s also left her more experienced then her two friends. She’s made connections at her various music classes with people, typically a bit older, who have opened her eyes to all kinds of different music. Her first love is Celtic, though, and her introduction to the Pogues started a love affair that’ll probably be lifelong. She, like Marni, has explored the woods and done a reasonable amount of camping. She’s more experimental then most in her age group, too. She’s not afraid to try new things since the results have been pretty good so far. And she’s not afraid to challenge taboos. She would ask questions at inopportune times (say at a funeral, “how’d they make the body look like that, anyway?). That could get her into trouble down the road but it’s not something she’s really aware of right now. So she’s stubborn and with a major zest for life. That zest really comes from what happened to her granddad. She doesn’t really realize it, but it struck her hard, too. She just deals with it in a very different way then either her mom or grandma. Those two women turned away from it, never wanting to deal with the suicide and certainly never wanting to talk about it. Sophie’s reaction was to live a little more and enjoy life. To try new things and never get stuck in the same way she thinks her granddad became stuck. In a way, out of the three of ‘em she’s the one who enjoys the forthcoming adventure the most. The 'Bot: This is a small creature that the girls encounter as they start exploring their new surroundings. He never speaks and they begin to realize that he must be mute, though they aren't positive about that diagnosis. He bonds quickly with Elora in particular and the two form a new if unusual friendship. 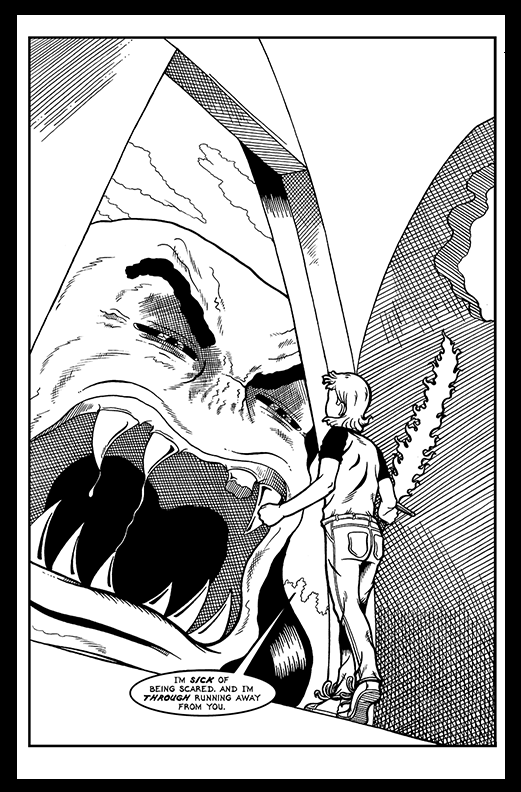 His story is told throughout the course of Stargazer and his ultimate fate plays a key role in the events of the second volume. I can't say too much more regarding his identity since it is so much a part of how the story unfolds. Readers seem to really like the little guy, though, and I'm very pleased about that.